Designed for the small business, the HP Officejet Enterprise Color Flow X585z multifunction printer delivers high quality colour prints at a lower price, and simplifies document production with two-sided and single-pass scanning. The multifunction printer is fast and tech-savvy with PageWide inkjet technology to enhance the workflow and productivity, but it's not the best choice for photos. The HP Officejet Enterprise Color Flow X585z features an eight-inch colour touchscreen and keyboard. The robust 36.3kg frame that measures 533mm wide, 546mm deep and 574mm tall houses a 2400x1200dpi inkjet print engine that works with HP PageWide Technology and pigmented inks. Basic connectivity is provided by two high-speed USB 2.0 host ports, Gigabit Ethernet, a foreign interface, a high-speed USB 2.0 device and a fax modem port. The Officejet Enterprise Color Flow X585z can handle up to 500 sheets through its default input tray, 100 sheets through the ADF and 50 sheets through the multi-purpose tray. The Enterprise Colour X585z MFP runs on 1792 MB of system memory. This model makes colour printing affordable. The Hewlett Packard Color Flow X585z colour multifunction printer saves time with an automatic document feeder. Data input is easier with a large and pivoting touchscreen and pull-out keyboard. For security, there's an encrypted hard drive and the HP Officejet Color Flow X585z inkjet printer works with HP Web Jetadmin for centralised management and control. 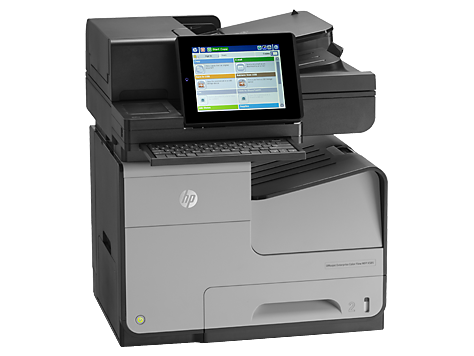 HP ePrint is supported for wireless and mobile printing needs. The HP Officejet X585z ink cartridges are very economical with long-lasting print yields of up to 10,000 black pages or 6,600 colour pages. The pigment ink in the cheap HP X585z inkjet cartridges can deliver water, fade and smear-resistant prints that are ideal for use in business. The HP Officejet X585z printer has a high initial price. Photo quality is sub par, and the Officejet Color Flow X-585z doesn't support borderless printing. With default settings, the speeds aren't that fast for high volume needs. The memory isn't upgradeable on the HP X-585z colour printer.